I was going back through my Drafts folder last night and found these Slices. They're 18 months old, and I can't believe I never published them. I think it was because that was around the time my iPhoto quit working, and I kept thinking that once I got access to my pictures, I'd post this with images. Well, that still hasn't happened. So I'm sharing these with you anyway. Jake would have been in the middle of 2nd grade (age 7-and-a-half), Amelia would have been about 4 and Nick, 10. FYI, I've decided to start fresh with iPhoto and just loaded the past year or so of pictures from my phone into it over the weekend. I also loaded our pictures from Costa Rica, so more posts will be coming. Not daily, but hopefully about once a week. I've missed it. While going through a bunch of random papers after we moved, I found a stapled set letting us know that Nick had been selected as the Star Student of the Week. Last December 4 . We were to have sent photos of him to be displayed in the classroom, gone to have lunch with him at a special table in the cafeteria, and written a letter about all the things we love about him that his teacher would have read to the class, among other things. Me: "Nick! I can't believe I'm just now finding this! Why didn't you give it to me when you were selected as Student of the Week? I feel terrible that we missed out on doing all of this for you." Nick: "You didn't. I told you about it back then." Me: "I don't remember that at all! I don't think I sent pictures, and I only remember coming to eat lunch with you on your birthday, not for this. And I don't remember writing a letter about all the things we love about you, either." Nick: "You did. IT WAS A SHORT NOTE." Grayson: "Okay, Jake, spell 'bandana.' "
We were eating supper at Texas Roadhouse, where they have TVs above some of the tables. America's Funniest Videos was on while we were waiting for our entrees to arrive. One video was of a girl about 6 or 7 years old sobbing with happiness and hugging her toddler brother, who had just taken his first steps. On the video, the man taking the video asked, "Why are you crying, sweetie?" And she sobbed, "I'M JUST SO PROUD OF HIM FOR TAKING HIS FIRST STEPS!" Jake: "Mommy. Did you see that?" Me: "The video of the little girl crying because she was so proud of her baby brother? Yes. So sweet." Jake: "Or. OR, they're in the Guinness Book of World Wecords for being the youngest married couple ever, and she was so pwoud because that was her SON taking his first steps." Me: "Hmm. That's pretty unlikely, buddy." Jake: "Yeah, I guess so. I mean, not ALL 6- and 7-year-olds are weddy for wo-mance like I am." Jake: "Do you want to know how I know I'm weddy for wo-mance?" Me: "I can't WAIT to know." Jake: "I don't woll my eyes at wo-mantic scenes in movies anymore." And just a few weeks later, I was folding clothes in the den while Jake was watching TV. Jake: "Quite fwankly, I can't believe they show this kind of wo-mantic content on Nickelodeon." Jake: "That young couple just kissed. I mean, I'M not bothered by it, but a lot of kids might be. I wemember when we were at the beach, we were watching a show one day and Gwant said, 'EVWYYBODY CLOSE YOUR EYES.' And evwybody did, except me. I mean, the people only KISSED. But even Gwant and Nathaniel didn't want to see it. I don't know. 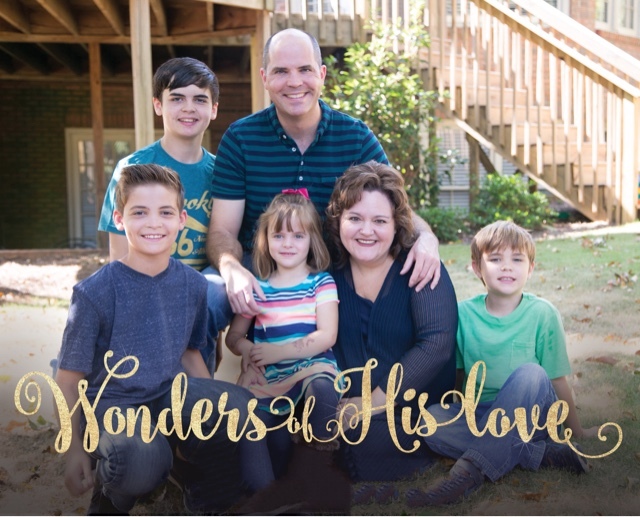 Kids just aren't weddy for wo-mance." Me: "Aww. You look so precious." Amelia: "I DON'T LOOK PWESH-US." Me: "Okay, well, you look cute." Amelia: "I DON'T LOOK CUTE." Me: "Well, what CAN I call you if I can't call you precious or cute?" Oh Lord. We're in for it. We were out to supper at our favorite Mexican restaurant, and the waiter came to the table to take our drink orders. Amelia and Jake were sitting on the same side of the booth with me. I ordered my drink, then looked at Amelia. Amelia: "I WANT SPWITE. Wait." [To Jake.] "JAKE, WHAT DO YOU WANT TO DWINK?" Amelia: [To the waiter] "WE'LL BOTH HAVE SPWITE." Going over Jake's spelling words with him one night, we were asking him to spell each word and use each in a sentence. Grayson: "Good. Now, use it in a sentence." Jake: "You have a lot of ammunition. CAN I HAVE SOME OF IT?" Amelia: "My teacher Miss Gwace is getting mawwied!" Me: "She is? That's exciting! To whom?" Amelia: [pause] "To a PWINCE!" Me: "Really?! To a prince? That's even MORE exciting." Amelia: "I know!" [sigh] "I can't WAIT to see their fuhst dance." Today at lunch on the way to the beach, a friend we were eating with asked Jake if he passed first grade. Jake: "Yes, actuwy, I was one of the smahtest kids in my class." Grayson: "ONE of the smartest?" Jake: "Yes, technicwy the second smahtest." Grayson: "How do you know that?" Jake: I really DID. It almost made me CWY. [wipes tears from both of his eyes] THAT WAS MY FUHST WEAL TEARJERKUH." Is 'Boss Baby' rated R? 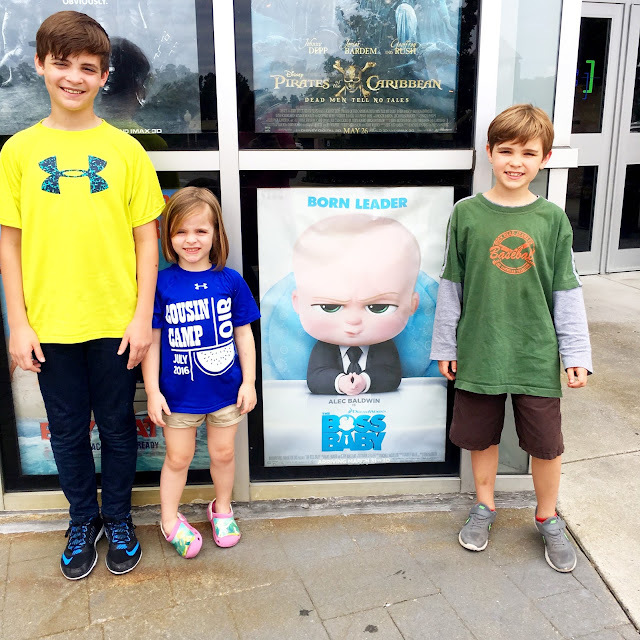 Amelia and Jake have been wanting to see Boss Baby for a while and the opportunity came up to see it over Memorial Day weekend. I use the word "opportunity" loosely here. Grayson and Nathaniel were on a scuba diving trip to the Florida Keys, so I took Nick, Jake and Amelia to the theater on Sunday for a "cheap" matinee showing. $40 in tickets and $50 in snacks and drinks later, we were in our seats and the trailers were beginning. First up was Transformers: The Last Knight, and then Wonder Woman. Next up was Star Wars: The Last Jedi. I turned to Nick and said, "These trailers all seem a little mature for the little kids who're here for Boss Baby. You think?" He nodded. But then the trailer for Cars 3 started, and I breathed a sigh of relief. And after that, Spider-Man: Homecoming -- which, while still not what I'd call a film for the toddler and preschool set, it was definitely preferable to what came next: THE MUMMY. INTERNET. Some serious STUFF goes down in that trailer. I looked over at Nick and I said, "THIS IS RIDICULOUS. This is COMPLETELY INAPPROPRIATE for 4- and 5-year-olds!" Nick had his ears plugged with his fingers and he was looking down at his lap. He couldn't even look at the screen. I could hear small children whimpering and a couple even crying elsewhere in the theater. I looked over to my left at Jake and Amelia and said, "Hey! Guys, DON'T LOOK AT THIS. It's WAY too scary. I'm not even looking at it!" Guess who wouldn't take their eyes off it it. Yeah, eyes wide as saucers and glued to the giant screen, Amelia said to me, "I'M NOT SCAWED AT AWE. THIS ISN'T SCAWY, MOMMY. ISS FINE." Finally, BY THE GRACE OF GOD the Disney logo came up on the screen. But Cinderella's castle was black, and thunder and lightning were going on behind the castle. For the last time, I again looked at Nick: "WHY is it thundering and lightning behind Cinderella's castle? Is Boss Baby a scary movie? Did I bring you to a movie about some kind of demented baby who literally tortures a family in their basement? WHAT. IS. HAPPENING." As if in slow motion, the movie started. And it was not animated. 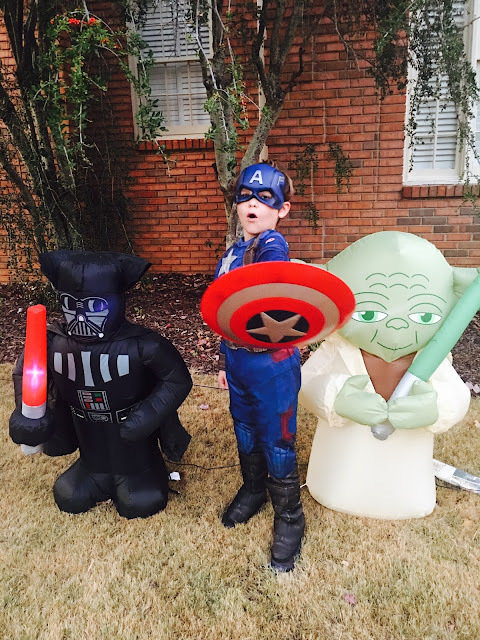 As it turned out, the little boy on the screen was a young Jack Sparrow. WE HAD JUST SAT THROUGH 20 MINUTES OF TRAILERS FOR PG, PG-13 AND NOT-YET-RATED FILMS. No wonder my Spidey Senses were on high alert. I looked over at Jake and Amelia (no worries about Nick, whose eyes were firmly fixed on the upper-right corner of the theater ceiling) and told them to just look at me, that this would all be taken care of in a minute. They paid me absolutely zero attention. Amelia, eyes still on the screen, said, "I WIKE THIS WRONG MOVIE." I looked back up at the screen just in time to see little Jack Sparrow sinking to the bottom of the ocean. I guess his dad took him up on his offer and threw him overboard? I'LL NEVER KNOW. Before it could get any worse, they finally cut the feed and got Boss Baby started for us. BETTER LATE THAN NEVER, CARMIKE CINEMAS, BETTER LATE THAN NEVER. So what's the over-under on Pirates of the Caribbean: Dead showing up on Amelia's Amazon Wishlist before her 6th birthday in September? I put the title of this post in quotes because it’s something I said six months ago. To more than one person. Something I said after I’d been dieting and exercising daily for three months, had lost 25 pounds and simultaneously hated life possibly more than I ever have. Including the semester in college during which I simultaneously failed Economics and Accounting. I actually titled a post "I hate everything and everyone" and began writing about how awful life was without lots of carbs and unlimited chocolate. I never published that post because I didn’t want anyone to worry about me. Like, about my mental health. And by “anyone,” I mean those of you who’ve been reading here for nine years as well as those of you who know me in real life and know me to generally be a glass-half-empty person – but not a glass-shattered-all-over-the-floor GLASS EVERYWHERE OH GOD GLASS EVERYWHERE person. Which is kind of where I was six months ago. And it all has to do with the fact that I gave up tasty food. Anyway, rest assured that things are better. I’m still struggling a little because I’m still eating more healthily than I used to and I only eat dessert once a week. But dessert once a week is better than dessert never. So in general I’m more balanced. See? That call to 911 isn’t necessary. But I haven’t written much lately and I’ve received several emails from readers who’ve noticed on Instagram that I’ve lost some weight, and you’ve asked what I’m doing and how it’s going. So I decided to give you the backstory. Last April I decided it was time to get healthy. Then I waited a month to start, because that’s how I roll. I downloaded the Couch to 5K app, opened the LoseIt app for the first time in two years, and I asked my GP to refer me to a weight-management clinic downtown. I wanted to see a nutritionist and I wanted to talk to a behaviorist – to see if I could figure out the REASONS behind my unhealthy eating habits. Keep in mind, I’ve lost and gained back the same 40 pounds probably 15 times over the last 25 years. I have proven time and time again that I can lose it – but I can’t keep it off. I always go back to eating the same way I did before, and the weight comes back. That’s why I wanted to find out what makes my brain and body work differently from the people who seem to be able to CHOOSE AN APPLE FOR THE LOVE. Well, I lost 18 pounds over the first six weeks or so, visiting the clinic three times. They weren’t doing anything for me other than checking my bloodwork and weighing me each time. I was eating regular food – just a lot less of it – and exercising every day, and I tracked it all in my apps. Just like I’d done a hundred times before. And it worked, just like before. But my mood, OH MY MOOD. It was dark. I had a short temper. And I snapped at the kids a lot more often. THEY NOTICED, you might say. I waited for the behaviorist to come in the room a few minutes later. Just steaming. You know what happened next? She never gave me the referral. And that was the last time I went to the clinic. I decided since I was handling it on my own anyway, I’d just keep doing it on my own, and if the unhappiness didn’t go away, I’d have my GP refer me to a psychiatrist. The clinic has never, to this day, called me to ask why I haven’t come back or how I’m doing. Fast forward to the end of 2016 and I’m able to report that by the end of last year, I lost a total of 46 pounds. For the past month or so I’ve just been maintaining, but I’d like to lose some more weight. I just needed a mental break, because I totally committed to it last year (if you couldn’t tell), and it really took a toll on me. Combined with the fact that I started a new job about six weeks into the lifestyle change – or the “HFL” as my friend Honor and I call it (Healthy F’ing Lifestyle™) – I needed a month to six weeks to kind of reset. I haven’t gone back to my old habits, but I’ve allowed myself popcorn with M&Ms once at the movies, dessert once or twice a week, Ranch dressing on EVERY salad I’ve ordered … and I haven’t felt guilty about a single bit of it. So, that’s the deal. No gimmicks. Walking or jogging five to six days a week, 1,100-1,300 calories a day, for seven months. Forty-six pounds. Total, abject misery with a pretty big payoff. You’re halfway through 8th grade and several inches taller than I am now. I remember 8th grade much more clearly than you’d think possible at my age, and when I think back to some of the things I did and thoughts that went through my head, I cringe. I think you’re probably more mature than I was at your age, though -- or maybe you’re just a little more reserved. You certainly don’t SAY much, for sure. YOU’RE A YOUNG MAN OF MYSTERY. I don’t want to make it seem like I think you’re hiding things, because I don’t. I just think because you’re clearly an introvert, and a teenage boy, you’re naturally quieter around me. You have a really small, intimate group of friends that seems to consist of three or four guys AND one girl. She’s a year ahead of you in school and we haven’t met her yet, but she’s kind of your BFF. So, there’s that. DADDY AND I ARE INTRIGUED. I’m so proud of you for the way you’ve just handled all of your schoolwork in middle school. You come home every day and tackle your assignments and studying, and your grades are top-notch. We never have to badger you about doing it, and you’ve already set a course for your future by declaring an interest in engineering at the high-school level. You’ve got the math and science skills you need (which you didn’t get from moi, no surprise), and I’m so excited to see where the next few years take you. Sometime over the last year or so you kind of maxed out on playing with your siblings. Now your default is lying on the couch upstairs with three things: your pillow, your blanket and your iPhone. OH, AND THOSE EARBUDS. I’m slightly worried that your earflesh is going to grow around them. Like, permanently. You don’t even take them out to talk to me … you just hit Pause. Fourteen is super-old. In case you didn’t know. It’s only four years from 18, which is the age I have to officially let you go and send you out into the world, flesh-embedded earbuds and all. I’M NOT READY. For a couple of years after you were born and Daddy was on the road almost full-time, it was just you and me against the world. And even after Nick was born, for a year or so there, it was still mostly you and me with Nick just along for the ride. Now you’re so darn independent and I literally have to look UP to you when I’m standing next to you … it’s so weird. In case nobody’s told you, you’re not a toddler anymore. All this growing happened without my approval or consent, and quite frankly, I’d like to take a moment and turn back time. In the absence of a magic wand, I just want to tell you how proud I am to be your mom, what an amazing young man I think you’re becoming, and that I always, ALWAYS want you to come home for Christmas. I’ll be lonely without you, my Christmas baby. I mean, I haven't BLOGGED, but I haven't given it up forever. It only seems like it. I WILL be back, but I don't have a schedule. It would actually be sort of easy to just post a photo a day with a one-line caption, but I mean, that's what Instagram is. And I don't want to just post the same thing here that I post on Instagram, you know? Seems like a waste of all of our time. For those of you that have been around for years, you know what this is about. It's about the time my dad witnessed what I call a holiday miracle, courtesy of an international visitor and the Salvation Army's Angel Tree. Jake: "Why do you say 'trick or treat' every time you go up to a door if there are no tricks involved? This is ridiculous." Me: "Well, everyone gives you a treat, so THAT'S why there are no tricks. Only if someone gives you no treat would you be allowed to play a trick on them." Jake: "So I wanna go back to the house that gave me POTATO CHIPS. And do we have any EGGS at home?" Today, you are 12. TWELVE! I think I wrote my last birthday letter to you on your 8th birthday. Can that be right? I’m not sure; I’ll have to go back and look to be positive, but I think that’s probably right. It was a really rough few years, buddy, I won’t lie. I mean, I don’t have to, because I know YOU know it, too. It wasn’t just hard for you, me and Daddy … it was hard for the entire family. And your teachers. And sometimes, like, general passersby. We tried a Christian counselor and, later, a psychologist. But in the end, after a lot — a LOT — of compromise and a lot of patience — EVEN MORE OF THAT — we’ve finally come out the other side. I’ve never doubted that your heart is solid gold. You’ve always shown moments of tenderness that astound me, and you’ve been a wonderful big brother to Amelia since the day she joined our family. You continue to show her the most attention, play one-on-one with her the most often, and be the most proud of her accomplishments of any of your brothers. Your temper DOES occasionally still get the best of you, but those times are now the exception rather than the rule. You’ve adjusted to middle school better than I ever dared hope, and you are a real social butterfly — you constantly ask to invite friends over to our house and you’re always being invited somewhere, whether it’s a weeknight or weekend. You’ve also really come into your own on the soccer field … I’ve lost track now of how many seasons you’ve played with Hoover Soccer Club, but you possess a real natural gift for the game. I love watching you play every Saturday and I’m so proud whether you score, assist or simply play your heart out each week. I can’t tell you how proud I am of the wonderful young man you’re becoming. You’re a natural leader and my hope and prayer is that you use that gift in the most honorable ways. I can’t wait.